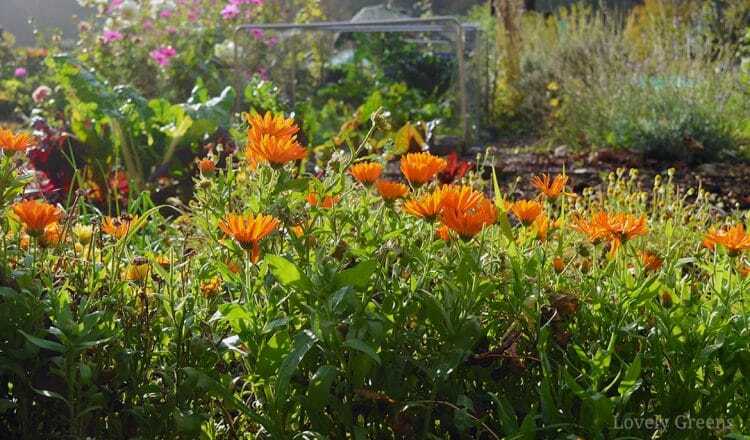 How to grow calendula officinalis flowers including a guide to sowing, growing, saving seed, ways to use it as a companion plant, and the best cultivars for medicinal use. 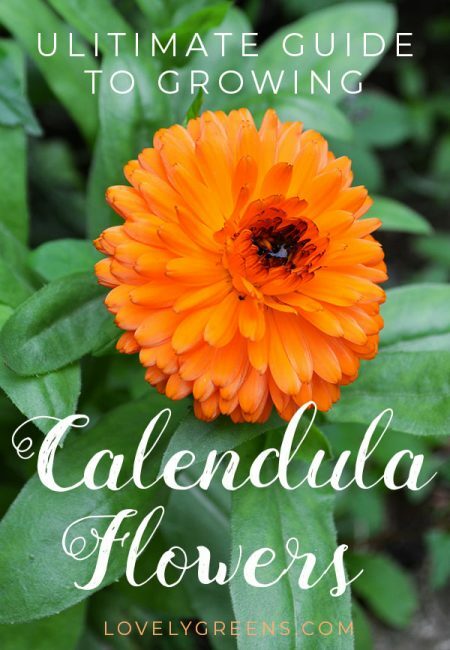 This is the first part in the growing calendula for beauty, health, and food series. If there’s only one skincare flower that you grow in your garden, it should be Calendula officinalis. Known by many as the Pot Marigold, this cheerful and easy to grow flower has a myriad of uses. The flowers can range in color from a buttery yellow to bright orange and being hardy, they can produce flowers from May right through to the first frost. Best of all, the more you pick them, the more they produce. 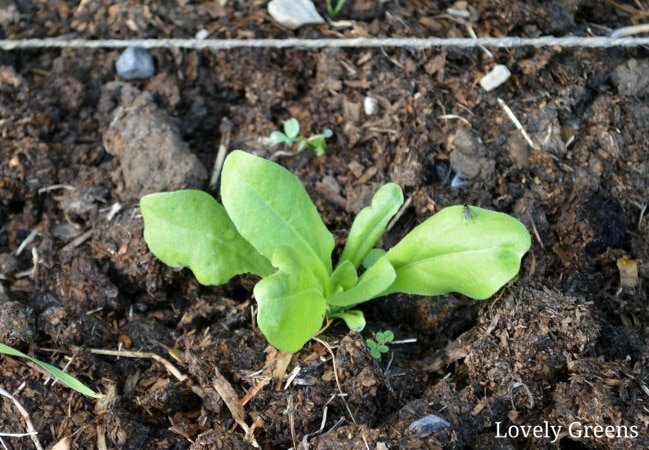 The tips below will show you how to grow calendula from seed. It does incredibly well in most open situations and will even tolerate different soil types, providing that they’re moist. Best of all, calendula is a flower that thrives on neglect and will grow better for being left alone to do its thing. Though Calendula officinalis is originally from the Mediterranean, its hardy nature has allowed it to colonize the temperate world. It grows well in most soil types and will even tolerate partial shade. 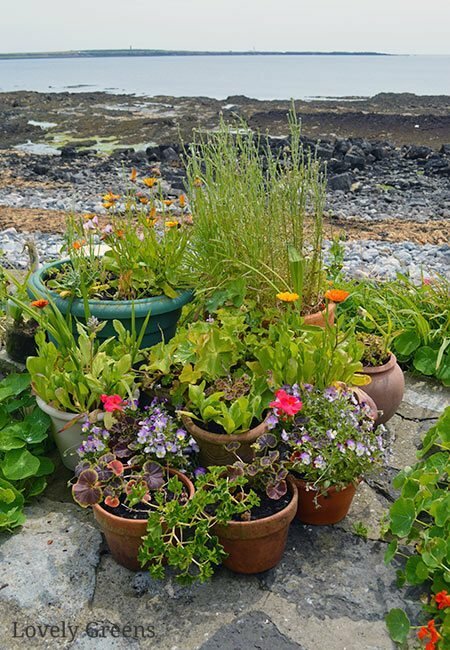 The plants do best in sunny positions though, especially on well-drained soil. Plant them there and they’ll reward you with hundreds of flowers. 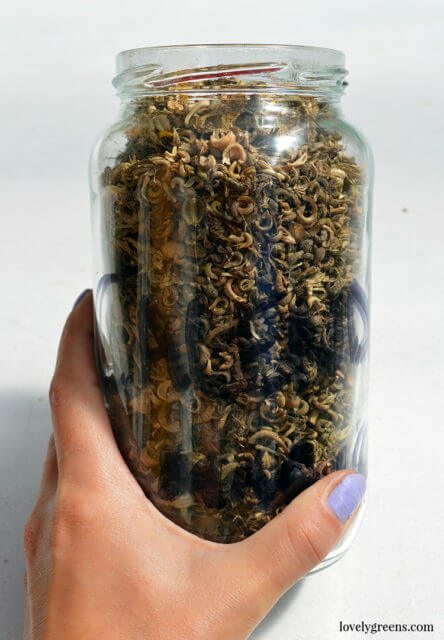 Sow the seahorse-like seeds in either autumn or spring. Sowing them in autumn will give the plants a head-start and you’ll see flowers much earlier. Calendula seeds germinate best at between 15-25◦C (59-77◦F). You may not see many seedlings emerge if it’s cooler or warmer than this. 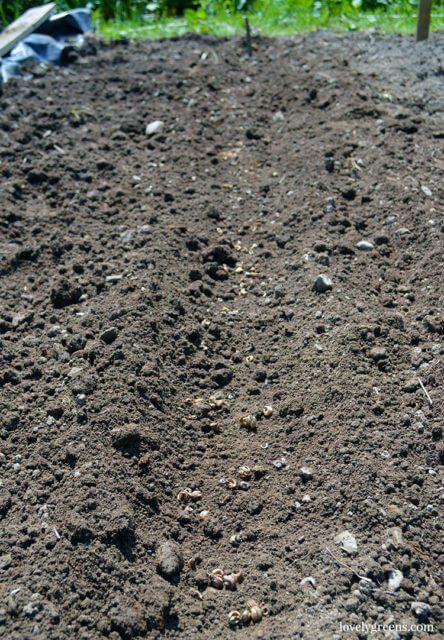 In autumn, sow six to eight weeks before the first frost in a tray or modules filled with one-part perlite (or grit) mixed with three parts multi-purpose compost. Top dress with horticultural grit, water, and keep moist under cover in a bright place. The seeds should be sown 1.25cm (1/2″) deep. You’ll see leaves emerge 6-15 days after sowing. 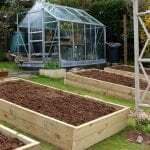 With protection from both the cold and slugs the plants will overwinter well and can be planted outside after the last frost. If growing in a tray, you’ll probably want to plant them individually in modules before winter. 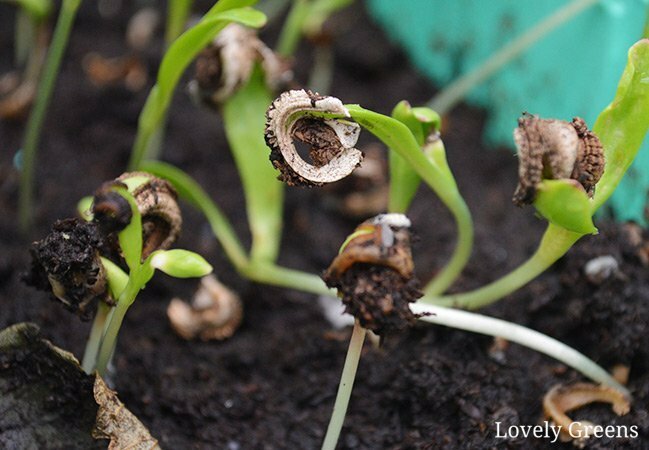 You can sow calendula seeds in modules in spring too. Use the same instructions above and sow 6-8 weeks before the last frost date if you’re growing inside or in a heated greenhouse. If your greenhouse is unheated, sow after the last average frost date. 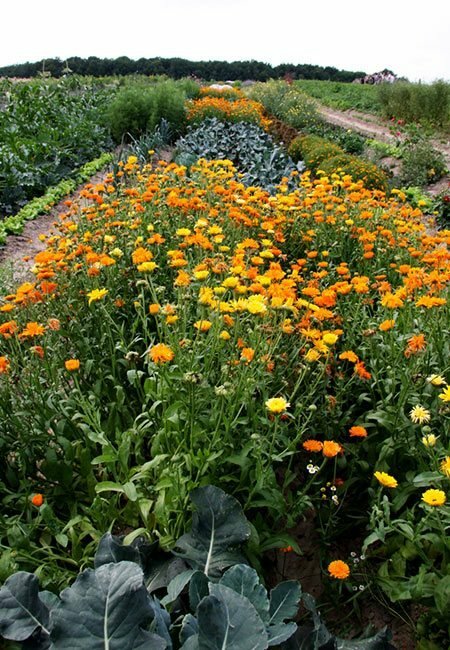 Calendula will grow in most soil types but does prefers fertile, well-drained soil. If you want a lot of flowers keep this in mind when you sow or plant them outdoors. They will grow fine in partial sun but I’d avoid growing them in full shade. Some sources may say that you can but these Mediterranean plants are truly sun loving. Their sunny golden flowers will remind you of that. When your little plants are two inches tall, harden them off and plant them outside. They’ll grow to their full potential if you can give them 1-2 feet in all directions. Direct sowing in spring is very easy. Between March and May, and well after the last frost, lightly scatter seeds in rows 18” apart. Protect the emerging plants from slugs using beer traps or another organic solution and when the young plants reach an inch tall, thin to about 15cm (6”) apart. Allow the plants to continue growing and when they’ve hit 2-3” in height thin them to 30-60cm (1-2 feet) apart. You can dig up the extra ones for replanting elsewhere or to give away. 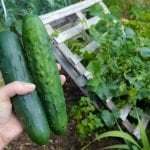 Put weaker plants on the compost pile. The above is general planting guidance. 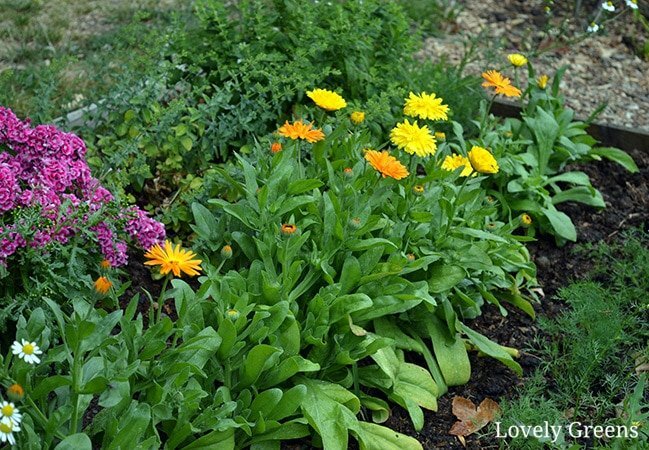 However, I tend to grow my calendula in slightly thicker plantings — between 8-10 inches apart. As you can see from the photo below, they grow just fine. It may be because my soil is fertile and moist enough to grow them this way or perhaps it’s down to their adaptability. Though you may be like me and grow calendula for their own purpose, they can also be dotted around the garden as a companion plant. They have properties that can ward off certain pests and relationships with certain other plants that may benefit both. • Gardeners actually use the attractiveness of calendula to their benefit and it’s often grown to draw aphids away from prized vegetables. The downside to calendula is that their dense growth creates a nice damp place for slugs and snails to lurk. That means you should avoid planting them near anything you don’t want decimated. Though Calendula is sometimes called a marigold or ‘Pot Marigold’ it’s not closely related to the common marigold you might be more familiar with. That plant is a Tagetes and has different companion planting suggestions. If you already have mulch on top of the soil you can sow directly into it. Otherwise, apply a mulch of compost, or whatever type is available and best for your region, after the plants are a good inch or two tall. Don’t cover the base of the plant but bring the mulch up to within an inch of it. Mulch will keep the soil underneath moist and stop weeds from growing. Calendula requires very little in the way of aftercare. My main advice on growing them is to not mess with them too much, other than picking. It’s over-watering and over-feeding that will cause stunted growth and other issues. Let them alone and they’ll happily grow and bloom all summer long. If your plants are starting to get tall and a little spindly, you can trim them back. Use scissors or your fingers to pinch back to a leaf node. Aim to keep your plants under 60 cm (two feet) in height. They tend to stay bushier and healthier that way, need less water, and stand up better in the wind. As far as pests are concerned, calendula can suffer from aphids later in the season. If you notice an infestation, spray the aphids off using soapy water. Most other insects and pests give resinous calendula a wide berth. Calendula is adaptable and will grow well in outdoor pots, containers, and window boxes. Aside from the harvest of flowers, they’ll also add a splash of color throughout most of the year. When growing in containers, make sure that the compost is moist but has good drainage. To make a suitable mix add 1-part grit or perlite with 1-part vermiculite and 3-parts multipurpose. Perlite adds drainage, Vermiculite aerates but also retains water, and the compost contains nutrients and a place for roots to grow. 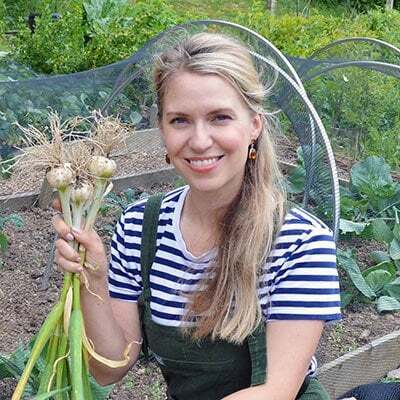 After planting, press the compost down and top-dress it with horticultural grit. This will help the compost retain water and keep weeds from colonizing the surface. 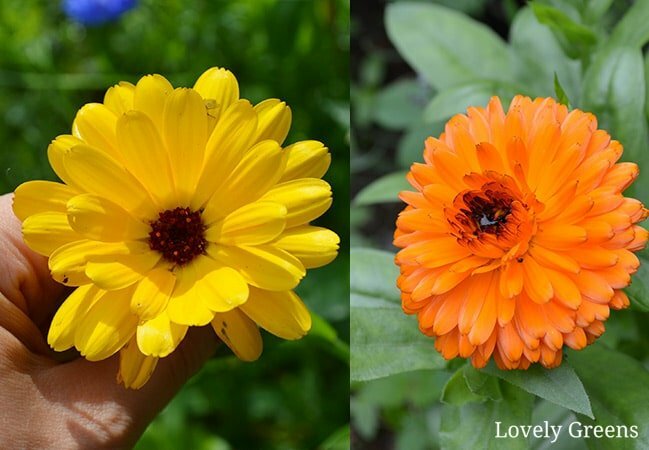 Calendula plants will begin blooming 45-60 days after germination and as long as you keep on top of picking the flowers, they’ll continue flowering. In fact, they’ll bloom all throughout the summer and autumn if you’re diligent with your dead-heading. In mild climates some will even continue blooming through the winter. On the other hand, in warm climates or during a hot summer you may find that your plants stop blooming. They’re hunkering down, bearing through the heat, and will start flowering again when it cools down in autumn. Calendula flowers aren’t just for show, they’re also a skin-beneficial plant and an edible flower. That means picking the flowers in their prime not only spurs more flowers to bloom but you can use the flowers too. 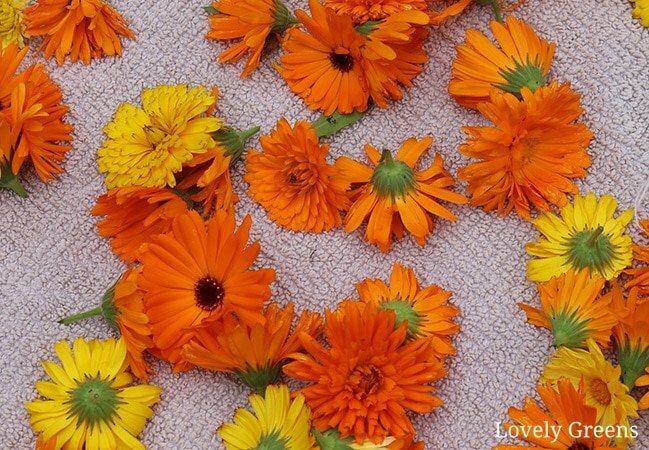 Make your own natural calendula skincare or use the petals to color and add flavor to food. The flowers themselves will usually be yellow to bright orange and 2-3” in diameter. 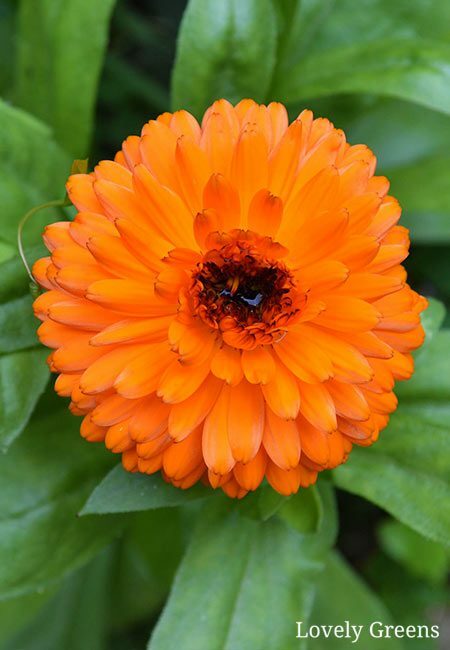 There are different varieties of Calendula officinalis with some blooming as single flowers and others with double rows of petals. You can also buy calendula seeds as mixes so that you could have single, double, yellow, and orange flowers all in the same row. Most of the 100 or so calendula officinalis cultivars have been bred for the ornamental market. 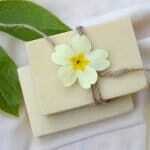 However, petals from all cultivars are edible and medicinal. It just means that the ones better suited for health and skincare are the more resinous varieties. • Erfurter Orangefarbige – double with orange petals. This is the best cultivar for using in herbal and skincare applications. • Resina – single with yellow petals and yellow pistils. Another good cultivar for herbal uses. Calendula is technically a perennial and if it isn’t touched by a hard frost it can survive for years. Because of the mild climate on the Isle of Man I’m pretty much guaranteed that at least a few plants will survive the winter. 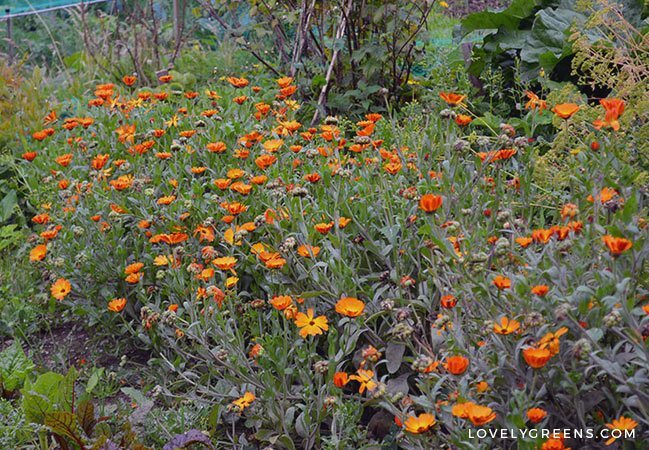 Calendula seeds are easy to collect and save off the plant. Once you’ve made the initial investment of seeds you shouldn’t need to buy them again. Allow some of the flowers to bloom, drop their petals, and transform into green seed heads. As they mature the seed heads will turn brown and they can be cut from the plant before the seeds are released. Cut the seed heads off on their own or with six inches or more of stem. Cutting with a bit of stem can be easier but will also remove part of the plant that will continue flowering. Tie the cut stems with a string and then place the flower heads in a brown paper bag. Tie it on so that it won’t fall off. Hang upside down in a warm and airy place until the stems are dry. Give the bag a good shake after this and most of the seeds will fall off. Tease the rest off if need be. If you’re just cutting the seed heads, fill the bottom of a brown paper bag with them and leave in a warm, dry place. When fully dry, use your fingers to pull the seeds out of the heads. Store dried calendula seeds in bags or jars in a place out of direct sunlight. For best results, use them within six years. This is the first piece in a series on growing and using calendula flowers. 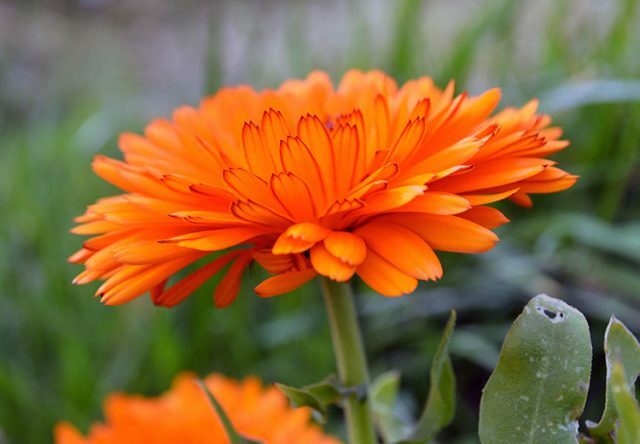 Though they’re fuss-free and cheerful garden flowers, calendula has many uses in skincare, health, and cooking. Where can I find calendula seeds? I will apply immediately to your guidance. Thank you very much. Really glad to have landed here . My wife has been trying to grow the calendula within the confinement of a wheelbarrow and she hasn’t been making much progress with them ,hence I decided to come look for information so I can help her out .The wheelbarrow she first used happened to be the true temper and I think its too shallow for this kind of planting offering very limited space.Moving it around was also a task task hence I advised her to use the gorilla dump cart . The cart has been quite efficient offering enough space and stability ..
with all this information i just gathered on how to gro the calendula am pretty sure she’ll be impressed by the outcome on her next trial . 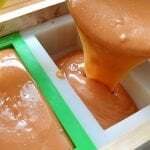 I would like to do a soap for washing cloth , with clean oil, without animal fat. The easy oils to found here in Argentina. are olive, sunflower, corn, peanut. I did try make a recipe but went rong. can you post a easy recipe at any time?. thank you , your work help me a lot. Can you get a hold of coconut oil Mirta? 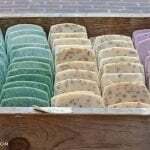 You can create a simple soap recipe using just coconut and olive oil. Lovely post and lots of great tips! I will be growing calendula Indian Prince for the first time this summer! I grew calendula for the first time this year and plan to grow a much bigger plot next spring! I saw this pin on Pinterest, great article! I had to search your website though because your pin has been hijacked! What if mine didn’t even come out of the ground?? Not even a teeny green spec of anything! I’m so sad! 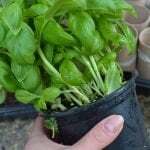 Try growing them in trays of compost first and then potting out. You’ll have a much better germination rate and won’t have as much issues with slugs and other pests getting to them first!